The Democratic Party of Washoe County, WashoeDEMS, holds phone bank at the headquarters in Reno. Volunteers call registered Democrats to encourage them to get out and vote. The Affordable Care Act, also known as Obamacare, united Republicans nationwide. In the last election, many GOP candidates promised to dismantle it. But that turned out to be a struggle and Democrats have now taken on health care as their key issue to drive out the vote this midterm. KUNR's Anh Gray has more. During the 2016 election, a then-presidential candidate Donald Trump led the charge to reverse the health law. He hammered that message at the last presidential debate in October of that year. “And one thing we have to do, repeal and replace the disaster known as Obamacare,” Trump said. Just this week, in an interview with Reuters, Senate Republican Leader Mitch McConnell called his party’s failure to repeal the ACA a disappointment. He also said that depending on the midterm’s outcome, the GOP could try a repeal again. “For the past few elections, health care has really been a Republican issue, mainly in their message of repeal and replace,” Political Science Professor Precious Hall of Truckee Meadows Community College explained. “This election, it’s actually the top rated issue for Democrats, because of what’s been happening in the past couple of years," Hall said. Volunteers for the WashoeDEMS at a phone bank. 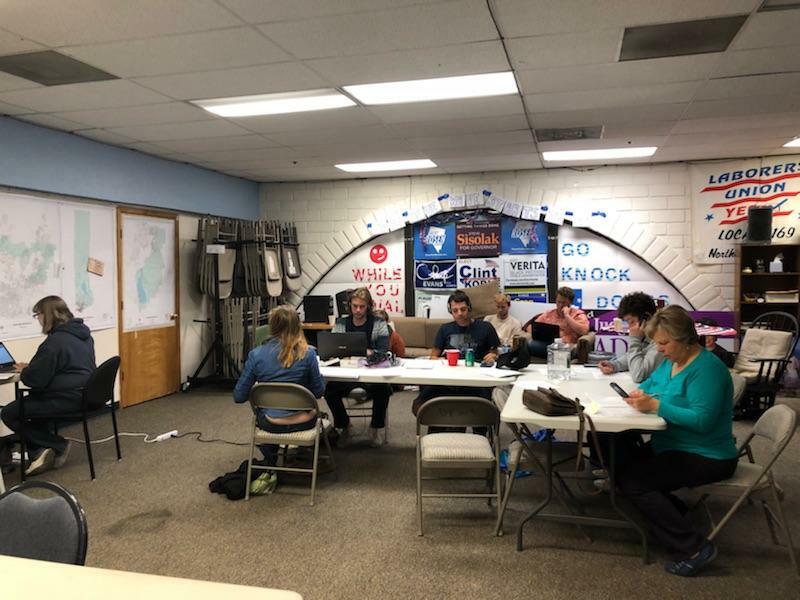 To rally its base, the Democratic Party of Washoe County has been canvassing neighborhoods and holding phone banks. On a weeknight at its headquarters in Reno, more than a dozen volunteers are making calls. Laura Gully and two of her daughters are volunteering. They’re each going through lists of registered Democrats, hoping someone picks up. For Gully, health care is a big concern because of her work at a call center for a Reno-based hospital. One of her daughters, Amanda Gully, says health care is also an issue she worries about. Last month, the Kaiser Family Foundation released a poll which found that 75 percent of respondents across both parties say protecting pre-existing conditions is “very important” to them. Some Americans worry that a current GOP-led lawsuit involving 20 states threatens to undo the ACA and the protections in place. Nationally, Democrats are using this issue to gain a majority in the House and Senate. In Nevada, the race between incumbent Republican Senator Dean Heller and Democratic Congresswoman Jacky Rosen is neck-and-neck. Sarah Abel is a spokesperson with the Nevada State Democratic Party. The Democratic party is attacking Heller's track record on health care as inconsistent. His seat is considered especially vulnerable since he’s the only Republican senator up for re-election in a state Hillary Clinton won in 2016. Democrats have a lead of nearly 70,000 registered voters over Republicans statewide, and they want to wrest back control of Congress to stop conservatives from continuing to chip away at the ACA. Last December, Congress passed the GOP-led tax reform bill that essentially eliminated the individual mandate, the health law’s tax penalty for the uninsured. With so much at stake, Democrats and Republicans are both campaigning hard to ensure their health care message is what resonates with voters at the polls. KUNR reached out the Nevada Republican party, the Washoe County Repbulican Party and Senator Dean Heller on several occasions. All parties did not provide comment. Who Could Turn Out To Vote In Nevada Midterm Election? Several factors could shape the upcoming midterm election in Nevada. The Nevada Secretary of State announced earlier this week that there are slightly more than 1.5 million active registered voters, a record-breaking number. Currently, Democrats are close to having 70,000 more registered voters than Republicans, accounting for a nearly five-point lead. The Silver State could also make history as the first female-majority led statehouse. KUNR’s Anh Gray checks in with a Truckee Meadows Community College Political Science Professor Precious Hall to learn how this election could play out. Senate Republicans failed to repeal and replace the Affordable Care Act, and a few GOP leaders have said they’re moving on to other priorities. But there’s still a lot of uncertainty about the future of the nation’s health care system. Reno Public Radio’s Anh Gray checks in with Director of Health Policy Research at the University of Nevada, Reno School of Medicine John Packham to break down how the ongoing tension in Washington is affecting our state. Senate Republicans have recently unveiled their plan to repeal and replace the Affordable Care Act. The health care bill is officially known as the Better Care Reconciliation Act. Voting on this proposed bill is expected later this week. Reno Public Radio’s Anh Gray sat down with health policy expert John Packham to learn what this legislation could mean for Nevadans.